The idea behind compassion-based meditation is that "the feelings we have about people can be trained in optimal ways," says Lobsang Tenzin Negi, who developed the protocol. Photo by Corey Broman-Fulks. A compassion-based meditation program can significantly improve a person's ability to read the facial expressions of others, finds a study published by Social Cognitive and Affective Neuroscience. This boost in empathic accuracy was detected through both behavioral testing of the study participants and through functional magnetic resonance imaging (fMRI) scans of their brain activity. "It's an intriguing result, suggesting that a behavioral intervention could enhance a key aspect of empathy," says lead author Jennifer Mascaro, a post-doctoral fellow in anthropology at Emory University. "Previous research has shown that both children and adults who are better at reading the emotional expressions of others have better relationships." 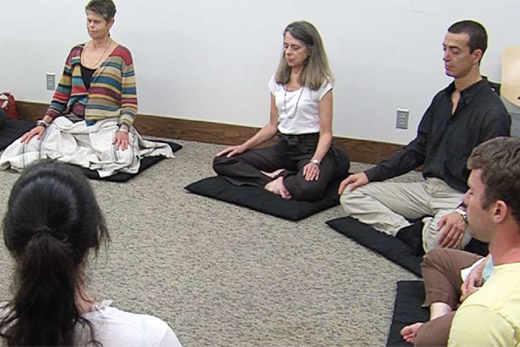 The meditation protocol, known as Cognitively-Based Compassion Training, or CBCT, was developed at Emory by study co-author Lobsang Tenzin Negi, director of the Emory-Tibet Partnership. Although derived from ancient Tibetan Buddhist practices, the CBCT program is secular in content and presentation. The research team also included senior author Charles Raison, formerly a psychiatrist at Emory's School of Medicine and currently at the University of Arizona, and Emory anthropologist James Rilling. When most people think of meditation, they think of a style known as "mindfulness," in which practitioners seek to improve their ability to concentrate and to be non-judgmentally aware of their thoughts and feelings. While CBCT includes these mindfulness elements, the practice focuses more specifically on training people to analyze and reinterpret their relationships with others. "The idea is that the feelings we have about people can be trained in optimal ways," Negi explains. "CBCT aims to condition one's mind to recognize how we are all inter-dependent, and that everybody desires to be happy and free from suffering at a deep level."